and satisfy our customers. Tell us what you need. >>>SVG can achieve power factor at about 1 and balance 3-phase current. There are many different types of electrical equipment which affect the electricity supply in different ways. Some electrical loads have a bad power factor, which results in higher electrical current flowing than is necessary to achieve the end result, irrespective of whether that is lighting, pumps, fans, machines, etc. This means more generators and a heavier distribution network is required, the results of which is that the users, YOU, have to pay for it all. Power Factor can be regarded as a measure of distribution efficiency and has values ranging from 0 to 1, where 1 is 100% efficient refer to total apparent power. Power Factor Correction equipment (PFC) improves the distribution efficiency so that less electrical current is needed to achieve the same result. A wide variety of products are available to do this, some of which operate automatically, in order to compensate for varying electrical loads which are common in today’s manufacturing plants and offices. What does Power Factor Correction do? § Increase the useful load from a given transformer. For example, a 1MVA transformer at 0.75 PF can only supply 750KW of load. Increasing to 0.95PF can supply extra 200KW of load. § Reduces current flow and power loss in cables and transformers, etc. § Reduces penalty charge from Singapore PowerGrid while reactive energy is more than 62% of real energy and reduces maximum installation capacity. We will be pleased to advise on your requirement and explain the benefits and cost savings which result. This can usually be done quickly, often a copy of two or three of your electricity bills is sufficient for us to determine your requirements. Why your company should install Power Factor Correction? Most large consumers have dedicated incoming mains transformers. 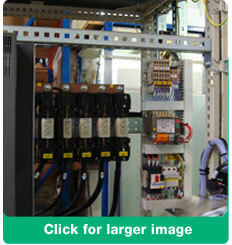 When these are fully loaded, site power usage cannot be increased unless the rating of the transformer is increased. If your power factor is poor and improving it, this will free up capacity, which is available for business expansion. It will save many thousands of dollars to use power factor correction equipment to do this, when compared to the cost of installing a new transformer – up to 80% less. In addition the equipment can be installed easily, quickly and without the need for a supply power down of several days. If you need Power Factor Correction, the sooner it is installed, the sooner you will save money that is from reactive energy penalty. If you feel that you may need Power Factor Correction, please contact us now, and our engineer will assist you according to your exact needs.